A charming and atmospheric town, dominated by the impressive battlements of its fine Norman fortress. Named after the river that runs through it, Arundel is a very ancient settlement, dating back to before the Roman invasion. Its narrow winding streets, which run down from the castle to the river, are mainly lined with Victorian architecture, plus a few 18th-c houses and some older coaching inns. The small town centre has a good range of independent shops, art galleries, tea shops and restaurants. The 14th-c parish and priory church of St Nicholas (within the castle grounds), retains much of its original character. Its Fitzalan Chapel contains several monuments and tombs for members of the Fitzalan and Howard families (the Earls of Arundel and Dukes of Norfolk). 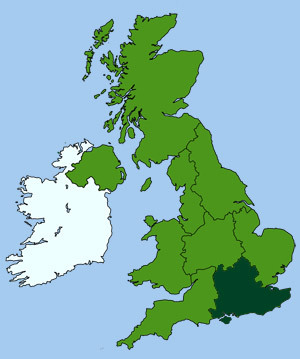 Arundel is also the seat of the Catholic Bishopric of Brighton and Arundel. The Dukes of Norfolk, who ruled from the castle, were once one of England's premier Roman catholic families, providing a strong catholic influence in the town and surrounding area. The Roman Catholic cathedral of 'Our Lady and Sir Philip' (in London Rd), was built in 1868-73 to a rich French Gothic style by Joseph Hansom - inventor of the Hansom Cab. It has modern stained glass windows and a high vaulted ceiling. Over a thousand acres of parkland run to the north of the castle, which contain fine beech trees and a lake. The park has excellent riverside walks, with rowing boats for hire in the summer. Also behind the castle is a delightful cricket pitch, a favourite sport of the late Duke. 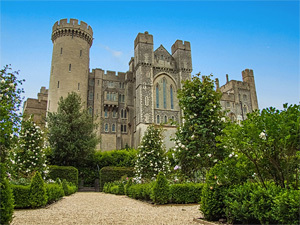 Arundel's magnificent, fully restored, medieval castle stands on a hill overlooking the town. The ancestral home of the Dukes of Norfolk, its interior is packed with classic period furniture, ranging from William and Mary to Victorian. The walls are hung with masterpieces by Gainsborough, Reynolds and Van Dyck. Suits of armour, clocks and ancient tapestries are also on display, including a grand historic library. Only the shell of the circular stone keep and original gateway survive from the original fortress, which was built around 20 years after the Battle of Hastings. Most of the castle was destroyed by Cromwell's forces in 1643, with cannon fire from St Nicholas's Church tower. It was not rebuilt until the 18th-c, when it became home to the Dukes of Norfolk who ruled there for nearly 500 years. A small independent museum devoted to the town's historical heritage, from pre-Roman times to present day. An area of wetland just north-east of the castle, is home to a variety of swans, ducks and geese from around the world.